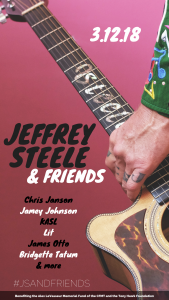 Join us for the 11th annual Jeffrey Steele & Friends March 12th, 2018 at the Franklin Theatre in Franklin, TN. The evening will support the Alex LeVasseur Memorial Fund of the Community Foundation of Middle Tennessee and our work with at-risk youth. This years partner charity will be the Tony Hawk Foundation. Please join us for an incredible evening on music and auction. TICKETS ON SALE NOW!